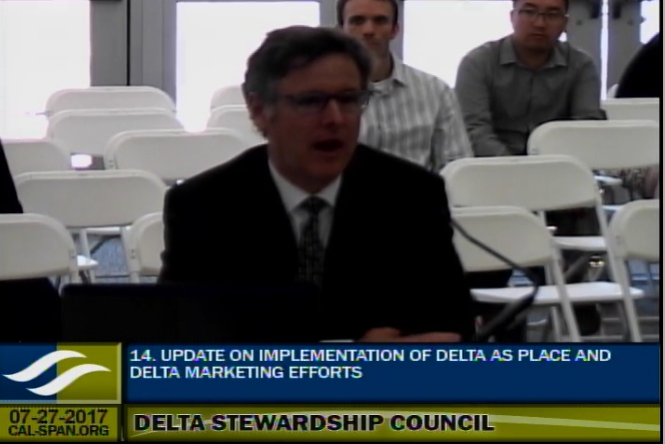 At the July meeting of the Delta Stewardship Council, Council members received an update from the Delta Independent Science Board on their recent paper on the Delta as an Evolving Place; they also heard an update on the activities of the Delta Protection Commission and the Delta Conservancy. 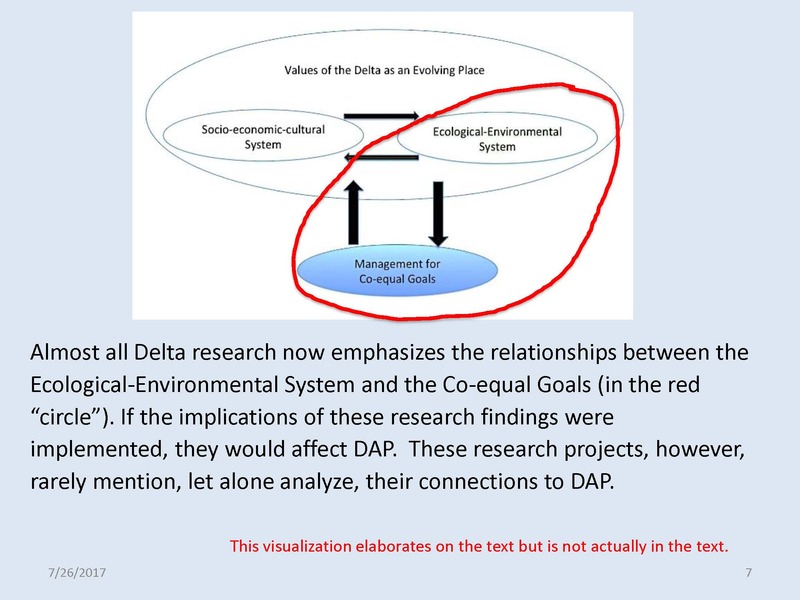 Almost all of the research has been done on the environmental system and the coequal goals, the part circled, with little or no reference to those other arrows connecting back to the social system, and to the larger issue of the values of the Delta as an evolving place, Dr. Norgaard said. Such research would benefit other processes, such as the Economic Sustainability Plan, the Levee Investment Strategy, and the Delta Plan itself, he noted. Dr. Norgaard said that more citizen and participatory science is needed, and this is something that Delta residents can help pick up and contribute to directly; they also argue that there’s value in looking further into indigenous knowledge and its role. “Those are the things that we need to start thinking more seriously through,” said Dr. Norgaard, thus completing his presentation. 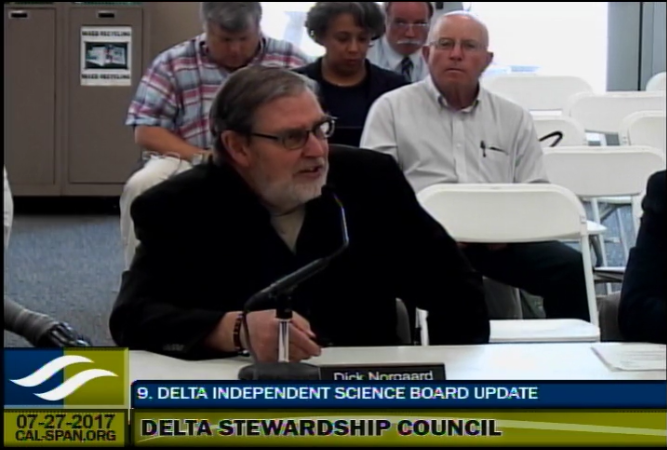 Chair Fiorini noted that levees and agriculture were considered defining issues in the Delta, and asked Dr. Norgaard to explain why they were not covered in this paper. 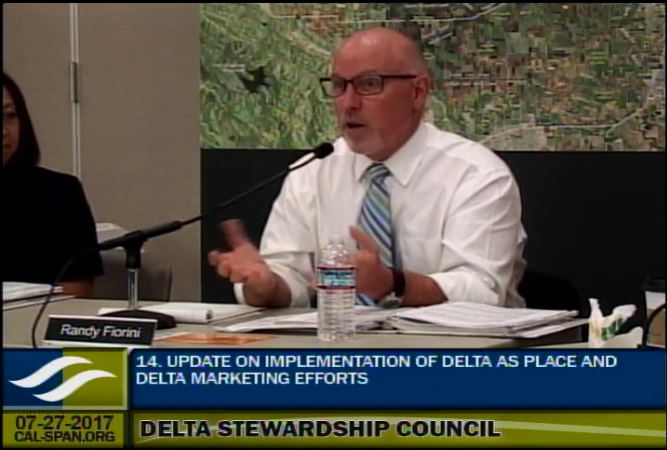 A later agenda item in the meeting featured updates on the actions that the Delta Protection Commission and the Delta Conservancy are undertaking on implementing Delta as a Place policy. Ron Melcer, Senior Environmental Scientist Supervisor with Ecosystem Restoration Unit introduced the agenda item by giving a few points of context. 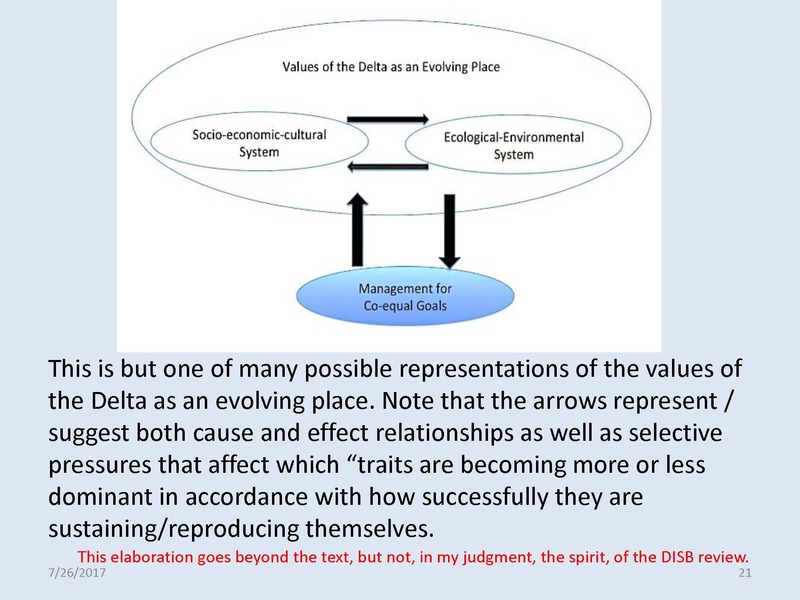 He noted that the Delta Independent Science Board report on Delta as an Evolving Place had found a limited amount of science that had been advanced which has focused on social processes underpinning the unique cultural qualities of the Delta; however much remains to be done. The Delta Plan identifies five core strategies intended to enable its vision on the Delta as a Place: to designate the Delta as a special place, to plan to protect the Delta’s lands and communities, to maintain agriculture as a primary land use, a food source, a key economic sector and a way of life; to encourage recreation and tourism that allows visitors to enjoy and appreciate the Delta; and sustain a vital Delta economy that includes a mix of agriculture, tourism, recreation, commercial, and other industries, and vital components of the state and regional infrastructure. He then turned it over to Erik Vink, Executive Officer of the Delta Protection Commission, and Campbell Ingram, Executive Officer of the Delta Conservancy. 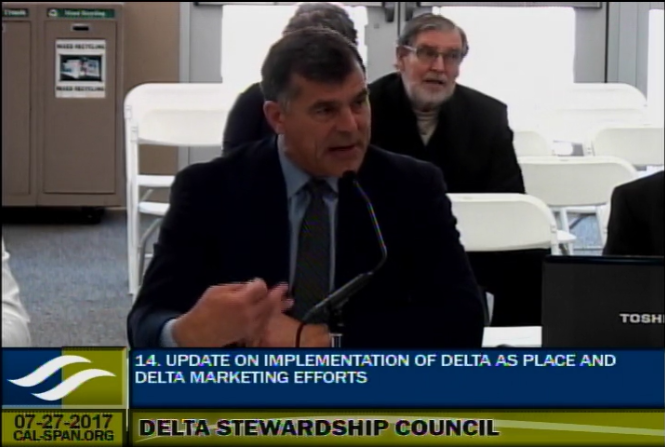 Next, Mr. Vink discussed their community action planning efforts, something that has a direct link to the Delta Plan. “The Delta Plan references actions to help improve the legacy communities in the Delta region, and so our community action planning effort is an attempt to improve quality of life, economic development, historic preservation, and public safety in these legacy communities through the Delta region,” he said. Three plans have been completed to date for Walnut Grove, Courtland, and Clarksburg; the plan for Isleton is currently in process. The plans are a result of conversations with those who live and work in these communities, asking them what would make a tangible difference to improve conditions in their community. Some actions are relatively modest compared to others, such as installing a stop sign on Highway 160 in Walnut Grove. Other issues are cell phone service deficiencies, broadband opportunities, and rural community health care. The Delta Protection Commission has coordinated an interagency workgroup that is intended to ensure that progress continues on implementing actions and policies identified in Chapter 5 of the Delta Plan. There is healthy participation from Delta agencies, Cal Trans, State Parks, as well as local agencies. The workgroup has been meeting for about a year and a half; the next meeting is August 22. 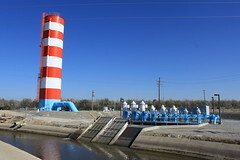 The Delta Protection Commission completed the Economic Sustainability Plan in January of 2012. It is supposed to be updated every 5 years, but the Commission did not receive specific funding to complete that. They did, however, receive funding to take a focused look at agriculture, which is the predominant economic driver in the Delta region. Update information in the 2012 report: This includes things such as the crop map of the Delta, the mix of crops, and the economic activity associated with Delta agriculture. Agricultural impacts from proposed restoration projects: The last time the Commission studied this, they were considering the Bay Delta Conservation Plan and the potential of 100,000 acres of restoration; they are now considering the more modest goals through EcoRestore and through the biological opinions, as well as the Delta Conservation Framework. Salinity impacts on Delta agriculture from Cal Water Fix: This involves looking at current modeling from Cal Water Fix and the State Water Resources Control Board on the salinity impacts on Delta agriculture. “That’s an evolving matter and we want to have the most current information we can on that,” he said. Campbell Ingram began by noting that they had a meeting of the board of directors, and had three significant actions: Kathy Miller from San Joaquin County as elected chair; the guidelines for the next solicitation for Prop 1 funding were approved, so on August 1st, $10 million will be available; and the update to the Conservancy’s Strategic Plan was approved. The Delta Conservancy partnered with the Delta Protection Commission and a task force of local people in the Delta that are actively marketing and trying to increase awareness about the Delta. 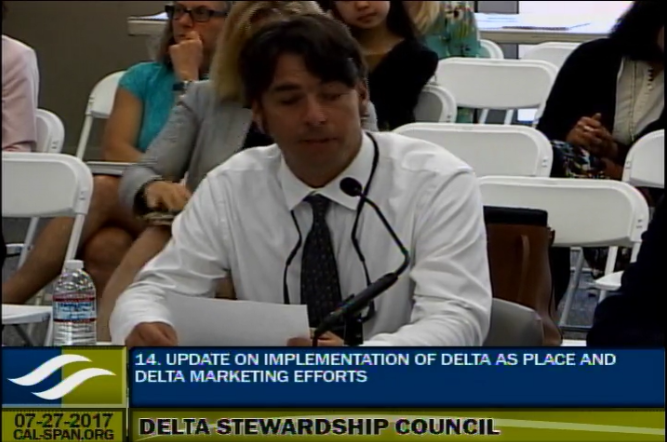 They developed a 5 year marketing strategy for the Delta that lists objectives to actively promote the Delta in a more effective way. They are trying to develop more comprehensive planning efforts in subregions in the Delta to consider where there can be ecological value in the system with the smallest footprint largely to Delta agriculture. They have just finished up with phase one of the Cache Slough planning effort which brought together all the representative interests to take a high level pass at the information available to really consider in developing a strategy. They are currently summarizing in the final report, and working to develop a scope of work for Phase 2, which will try to bring all that information to bear on the development of a more comprehensive regional plan which will consider how to restore a resilient ecosystem with the least amount of conflict with agriculture. Starting in the western Delta and moving up the Mokelumne, Mr. Ingram said there is a tremendous amount of acreage that is either publicly owned or publicly financed which presents an opportunity to achieve ecosystem restoration objectives without taking additional land out of production. The Conservancy worked extensively with a group of academics, scientists, and agencies to develop a carbon methodology for the Delta. They raised funding and were able to create a California wetland protocol which was adopted by the American Carbon Registry in April of this year, and that covers California coastal wetlands, managed wetlands in the Delta, and rice cultivation in the Delta. They are actively working to get pilot projects up and running. For the agenda and meeting materials for the July meeting of the Delta Stewardship Council, click here. 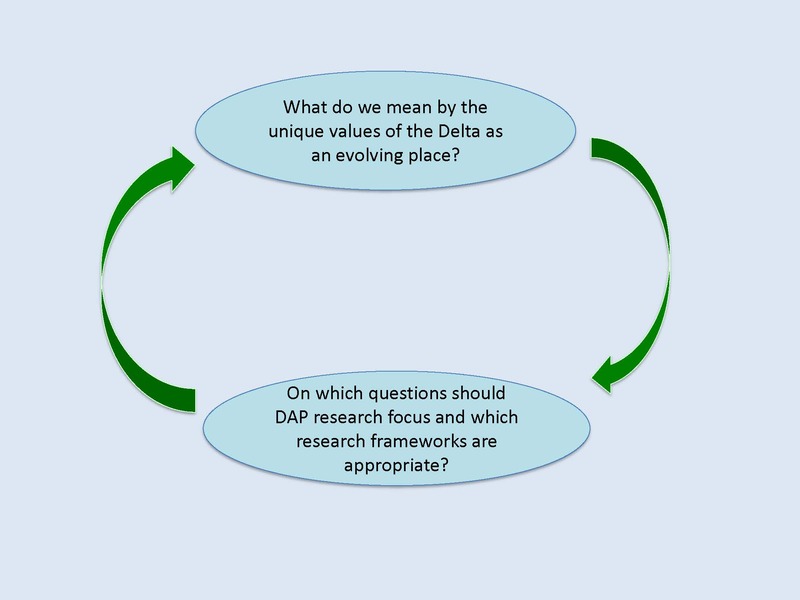 For the DISB report, Review of Research on the Sacramento-San Joaquin Delta as an Evolving Place, click here.